The Taoist temple, Wong Tai Sin at Chuk Yuen Village in Kowloon is Hong Kong’s busiest and probably best known temple with over 10,000 visitors each day. The temple god, Wong Tai Sin, also known as Huang Chu-ping, heals the wounded, saves the dying and punishes evil and is worshipped by not only the sick but by people with business problems. The temple, which is adorned with ornate Chinese architecture, provides a tranquil environment amongst the surrounding high-rise buildings. According to legend, the temple is named after Master Wong Cho Ping, a shepherd boy born in 328AD during the Tsun Dynasty to a poor family from Lan Xi City of Jin Hua County in Zhejiang Province on the eastern coast of mainland China, who at the age of 15 was taught by a fairy how to refine cinnabar into a medicine believed to cure all ills. After living in seclusion for 40 years learning this art he was found by his brother, Wong Cho Hei, following guidance from a Taoist master and from then on was called Wong Tai Sin. When his brother asked the whereabouts of the herds of sheep, Wong Tai Sin took him to a mountain, pointed into the distance and shouted at white rocks which immediately turned into herds of sheep. Wong Cho Hei was so impressed by this miracle that he joined Wong Tai Sin in practising Tao and both later became deities. In 1915, father and son Taoist priests Liang Renan and Liang Junzhuan brought a portrait of Wong Tai Sin to Hong Kong from a local temple called Sik Sik Yuen in Xiqiao in Guangdong Province and the portrait was displayed at a small temple in Wan Chai, where the Sik Sik Yuen charitable organisation which runs the Wong Tai Sin Temple was established. In 1921, following divine guidance from Wong Tai Sin, the portrait was moved to a temple on the site of the current temple which is considered to have good fung shui with the backdrop of Lion Rock and the temple facing the sea. 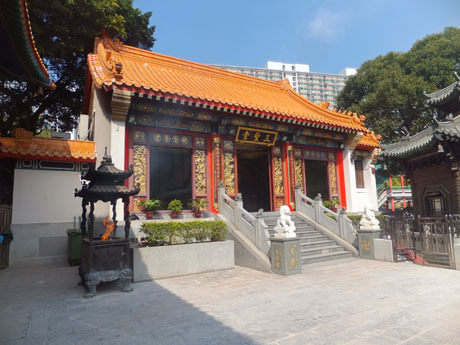 The temple was a private shrine for Pu Yi Tan Taoists until 1934 when it was opened to the public at Lunar New Year. The temple survived the wide destruction of Hong Kong which took place during the Japanese Occupation in World War II, an achievement attributed to Wong Tai Sin’s powers and in 1956, with government approval, it was opened to the public all year round after the government had initially indicated its intention to reclaim the temple and surrounding area for public housing development. A small admission fee was charged and donated to the Tung Wah Group of Hospitals which still maintains its connections with Sik Sik Yuen. 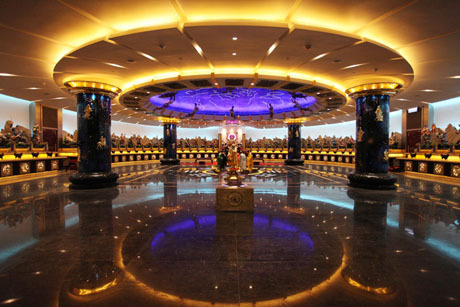 The present main worship hall was built between 1969 and 1973 and substantially rebuilt between 2008 and 2011 at the same time as the Tai Sui Yuenchen Hall, an underground palace, was built at the temple. The first “Sik” of “Sik Sik” represents thriftiness, whilst the second means colourful things or human desire. Together the words represent Spirituality, Tranquility, Intuition and Purification and the Sik Sik Yuen religious charitable organisation promotes the worshipping of Taoism, Buddhism and Confucianism with the guiding principle of “To Act Benevolently and To Teach Benevolence”. 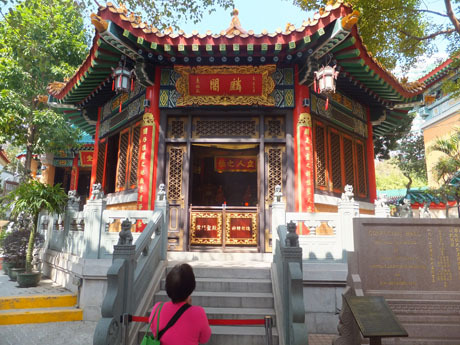 Whilst primarily a Taoist temple, Wong Tai Sin also has Buddhist and Confucian worshipping halls. The Sik Sik Yuen is dedicated to medical, education and elderly services and operates clinics and schools as well as providing social services. The temple complex is entered through a large memorial arch and covers an area of about 18,000 square metres. It is the only temple in Hong Kong which is permitted to conduct Taoist wedding ceremonies and issue mariage certificates. 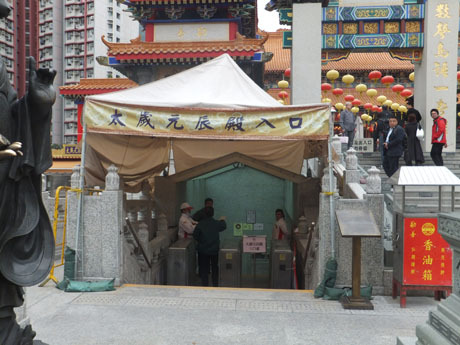 Visitors to the temple are encouraged to follow a one-way system around the complex which is made compulsory at busy times such as Lunar New Year and Wong Tai Sin's birthday on the 23rd day of the 8th Lunar Month. On Lunar New Year's Eve the temple closes at 5-30pm then reopens at 9pm by which time thousands of worshippers are queuing to rush to the Main Altar at midnight with burning incense sticks since tradition dictates that the earlier the offering is made the better the chance of good luck in the coming year. THE MAIN ALTAR - the splendid main altar of worship to Wong Tai Sin was rebuilt between 1969 and 1973 and renovated between 2008 and 2010. A portrait of Wong Tai Sin stands in the middle of the main altar and wooden sculptures behind the altar depict the story of how Wong Tai Sin became a god. Taoist, Buddhist and Confucian scriptures and images are engraved on the temple walls.The architecture is traditional Chinese in style with large red pillars with gold calligraphy, multi-coloured carvings and a yellow tiled roof. The altar is protected by a statue of the Monkey King which stands outside, to the right of the altar. MAIN ALTAR PLATFORM - the large open space in front of the main altar is the main worshipping place where worshippers hold bundles of burning incense and bow to Wong Tai Sin three times before going inside to kneel and shake fortune sticks until one fall out. The stick is exchanged for a piece of paper with the corresponding number for interpretaion by a soothsayer and can be taken to one of the 161 fortune telling stalls, run by Tung Wan Group of Hospitals, in the two-storey Fortune Telling and Oblation Arcade at the temple. The main altar platform was renovated and extended at the same time as the main altar between 2008 and 2010. SECONDARY WORSHIPPING PLATFORM is located at a lower level and connected by a Pai-fong (gateway) and steps to the main platform. 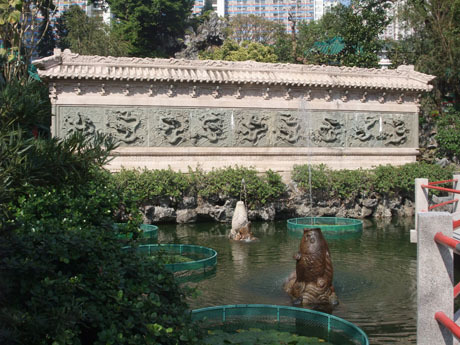 The secondary platform contains bronze statues of the 12 Zodiac Animals and was co-designed by specialists in ancient architecture from Sik Sik Yuen and Beijing. CAICHEN SHRINE - worshipping General Chiu Kung Ming, the God of Prosperity, one of the four guarding Gods of Taoism, said to bring prosperity to wealth chasers. YAO WANG SHRINE - dedicated to Suen Sze Miu the King of Medicine of Taoism, a famous medical practicioner and Taoist master in the Tang Dynasty. He was named Master Miu Ying posthumously during the Sung Dynasty. FUK TAK SHRINE - dedicated to To Ti, who are two celestial gods protecting the earth, and according to Taoist scriptures, are the Gods blessings and virtues. TAI SUI YUENCHEN HALL - opened in 2011, this "hi-tech" underground palace of about 10,000 square feet cost HK$100 million and took three years to construct. 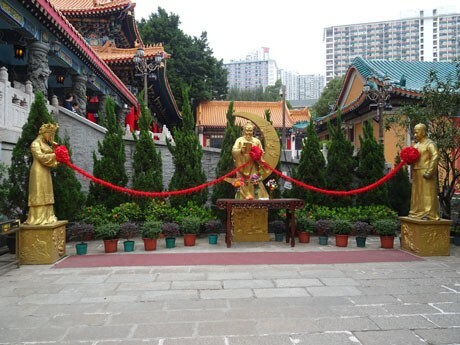 It worships the Goddess of Great Dipper, 60 Tai Sui (Protectors for each year of the 60-year Calendral Cycle) and Yuenchen (Gods of the 60-year Calendral Cycle). An entry fee of HK$100 applies. No incense sticks are allowed and worshipping is made "electronically". For a further HK$300 fee worshippers drop written prayers into a small box. An electronic statute related to the worshippers birth cycle lights up and puffs artificial smoke to acknowledge acceptance of the offering. The hall is emblazoned with gold, marble, LED lights and motion detectors. It has a vaulted ceiling with a spectacular dome which digitally replicates the Hong Kong sky and rotates in accordance with the seasons. Two HK$3 million floor-to-ceiling marble and rare gemstone wall hangings adorn the entrance. 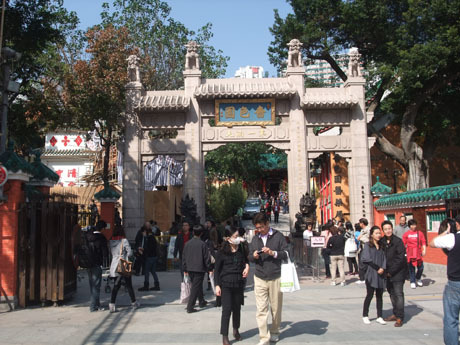 THREE SAINTS HALL - is where three Taoist, Buddhist and Confucian deities are worshipped. 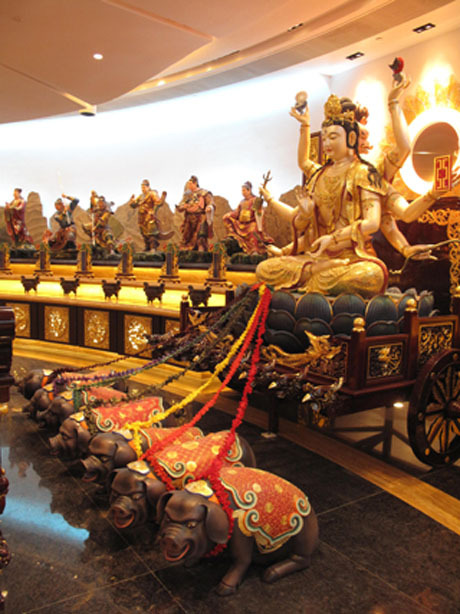 Master Lui is the deity of Taoism, Guan Yin is the bodisattava of Buddhism and Guan Di is commonly worshipped by believers of Taoism, Buddhism and Confucianism. YUELAO AND COUPLES - statue of Yue Lao, the matchmaker and God of Marriages, and male and female statues. 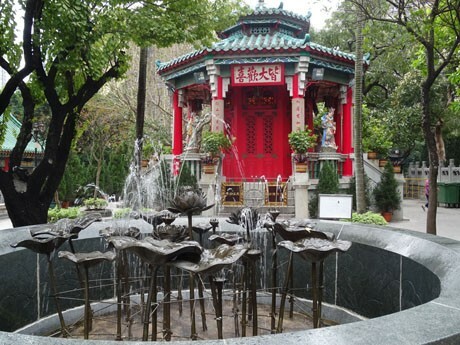 BRONZE PAVILION - built in 1924 and the resting place of Wong Tai Sin and females are forbidden. The exterior of the pavilion is covered in bronze tiles which represent "Metal" in the Five Elements. Only Taoist masters of the Yuen are allowed to enter the pavilion. ARCHIVES HALL - built in 1924 as a place for storing religious scriptures but now used as the temple's general office. The building and furniture are mainly of timber construction and represent "Wood" in the Five Elements. YUK YIK FOUNTAIN - a circular stone fountain comprising seven lotus flowers spouting water, built in 1936 but recently renovated. Represents "Water" in the Five Elements. 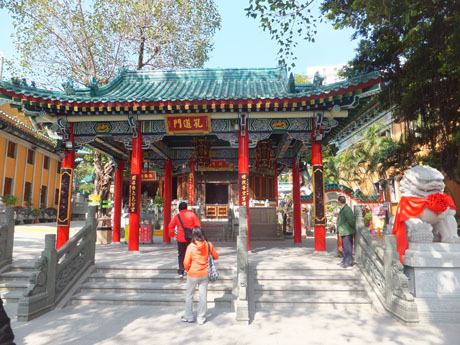 YUE HUNG SHRINE - built in 1933, it worships the Buddha of Lighting the Lamp and, painted red, represents "Fire" in the Five Elements and by promoting Buddhism embraces the three religions (with Taoism and Confucianism), having the same roots. EARTH WALL - built 1938, is a 3-metre structure roofed with blue-green glass tiles. The wall contains scriptures "Ching Ling Po Cave" and "Ji Fu". It represents "Earth" in the Five Elements. WANG LING-GUAN SHRINE - originally the Po Chai Pavilion, this 2.6 metre tall shrine worships the Taoist God of gate-keeping, Officer Wong Ling. The statue is bronze with stone dragon pillars and sculptures. Next to the Wang Ling-guan Shrine is a monument marking the collaboration between the Sik Sik Yuen and Tung Wah Group of Hospitals which transferred ownership of the Po Chai Pavilion to the Yuen in 2009. YEE MUT HALL (MEMORIAL HALL) - rebuilt in 1982 it contains memorial tablets of deceased Pu Yi Tan Taoists. CONFUCIAN HALL (UNICORN HALL) - is where Confucious, Master K'ung, the grand master of education and thinker of China and his 72 disciples are worshipped. It is said that when Master K'ung was born, a unicorn carrying a Jade passed by led to unicorns becoming known as a metaphor for Confucious. FUNG MING HALL (HALL OF THE PHOENIX SONG) - opened in 1981 this is a two-storey hall in traditional Chinese palace design with green glass tiled roof. It is used for holding local community activities. During renovation of the Main Altar between 2008 and 2010 it was used as the main worshipping hall. PO CHAI HALL - Opened in 1981 and previously known as the Medical Block, the two-storey Po Chai Hall contains a herbal clinic on the lower floor which provides free Chinese medical consulation and medicine distribution to the general public. The upper floor serves as offices. The hall was temporarily used as the main worshipping hall during renovation of the Main Altar during 2008 - 2010. GOOD WISH GARDEN - Opened 1991 is an exotic 5,600 square-metre Chinese-style garden with architectural features resembling a miniature replica of the Summer Palace in Beijing. 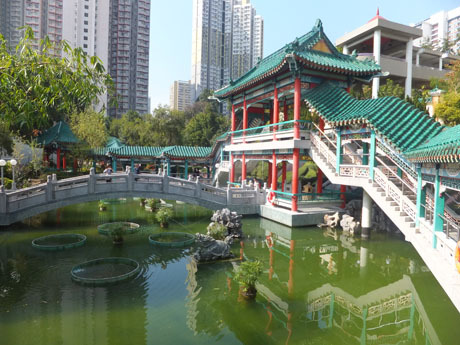 Pavilions, bridges, pagodas, streams, rocks, ponds and gardens are linked by a long corridor. 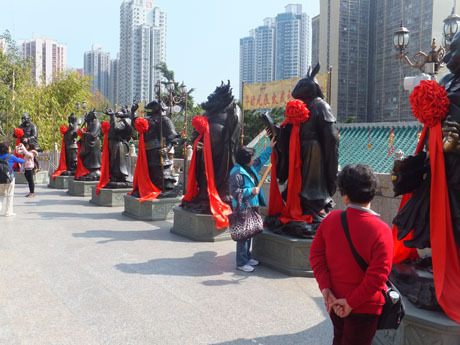 Within the Good Wish Garden is the STATUE OF SHEEP, donated by the city government of Lan Xi, Zhejiang Province, Wong Tai Sin's birthplace, to celebrate the 75th anniversary of the Sik Sik Yuen in 1996. The statue is made from white jade and depicts the miracle of Wong Tai Sin transforming piles of white boulders into sheep. NINE DRAGON WALL - a replica of the famous Nine Dragon mural in Pei Hai Park in the Forbidden City in Beijing. Behind the wall are sculpted the Chinese characters of "Nine Dragon Wall" and an extract from a poem written by the former President of the Chinese Buddhist Association, Mr Zhao Pu Chu. 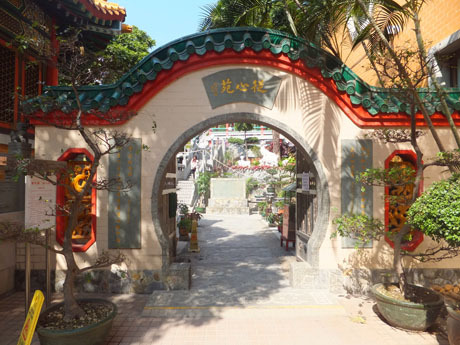 BENEVOLENCE PREACHING GALLERY - opened in 1996, built in traditional Chinese style, contains modern multi-media installations describing Taoist culture, education and medical services of the Yuen. 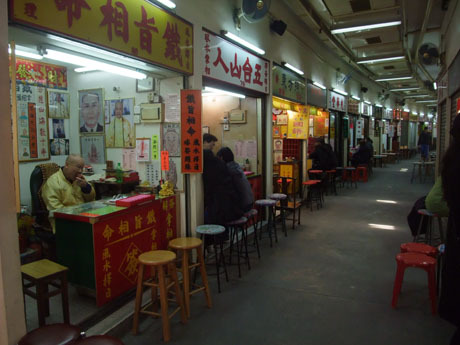 FORTUNE-TELLING AND OBLATION ARCADE - a two-storey covered arcade containing 161 soothsayer booths, run by the Tung Wah Group of Hospitals, and 41 temple goods stalls selling incense sticks, paper offerings, souvenirs etc. Many of the fortune tellers speak English. 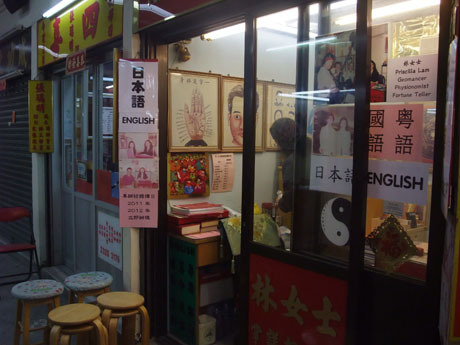 Expect to pay from HK$100 up for a fortune telling session. 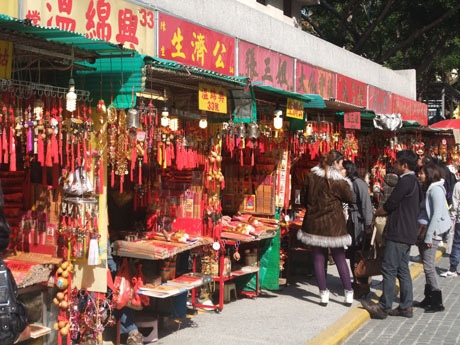 During Lunar New Year 2017, the temple introduced a "soft launch" of automatic fortune-telling booths enabling worshippers to swipe a divination stick embedded with radio-frequency identification tag on an electronic scanner to acquire a print out of their fortunes. Three booths were available at the launch and the service was free of charge for the initial phase. 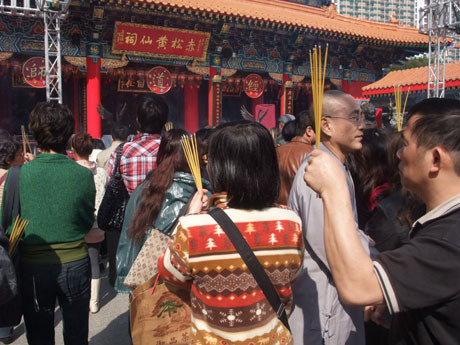 Worshippers are advised to bring only nine incense sticks into the temple and proceed first to the designated incense burning area which is adjacent to the Secondary Worshipping Platform next to the Benevolence Preaching Gallery. Three sticks can be offered at each of the three offering areas in front of the Main Altar, Three Saints Hall and Yue Hung Shrine. There is a suggested one-way route around the complex for visitors. This is, however, only strictly enforced at very busy times such as Lunar New Year. OPENING HOURS - The Temple, Good Wish Garden and Tai Sui Yuenchen Hall are open from 8am to 5pm daily*. The General Office is open from 7am to 5pm daily. 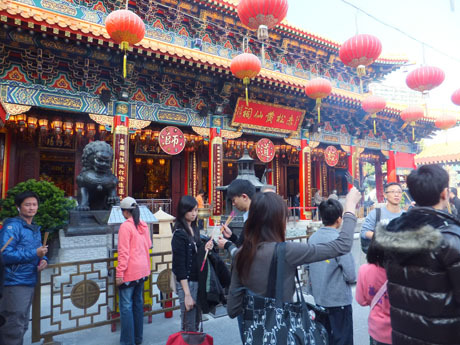 * at Chinese New Year's Eve Wong Tai Sin Temple closes at 5pm and .reopens at 9pm and stays through the night and until 6-30pm on the First Day of Chinese New Year, The Tai Sui Yuenchen Hall is closed on Chinese New Year's Eve and Chinese New Year's Day. 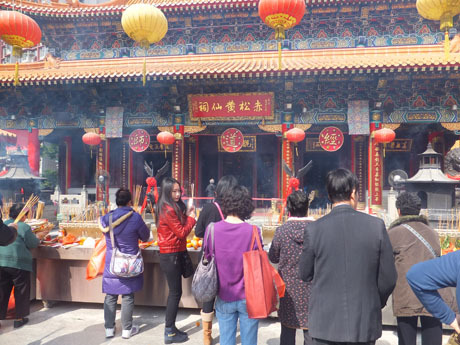 ADMISSION - there are no formal admission charges for visitors for entry to Wong Tai Sin Temple, except fot the Tai Sui Yuenchen Hall, but donation boxes are located throughout the complex. The admission fee for entry to the Tai Sui Yuenchen Hall is HK$100. MTR - Wong Tai Sin Station (Kwun Tong Line), exit B3 leads directly to the temple.